Wrought metal door handles and equipment including genuine metal band hinges and ornamental metal hinges to give your door that old-world allure. Our metal door manages, and hinges tend to be hand forged from solid metal. Please click on photos for more views and information. Our give Hammered Iron Pulls are wrought from solid iron round bar. Gorgeous hammering detail, heavy metal experience, and ideal for Rustic, modern, Asian, Industrial, or anywhere you need breathtaking hand hammered information and clean outlines. Shown here in our exclusive tumbled metal finish. Use vertically and horizontally for Drawer Pulls, Cabinet Handles, and Door Handles. Level is measured to underside of handle. Our Tuscan Style wrought-iron Door Handle is good for austere gates and doors. 3" x 12" Hand Hammered Backing Plate, 9" manage is hand hammered 5/8" solid iron. Can be used with any closing system, deadbolt, or latch. Choose finish in commentary at checkout. Our Tuscan Style Wrought Iron Door Handle is ideal for rustic gates and doors. 3" x 18" give Hammered Backing Plate, 13" Handle is hand hammered 1" broad solid metal. Can be used with any closing system, deadbolt, or latch. Shown within unique iron oxide patina finish readily available only at Paso Robles Ironworks. Give forged heavy weight old-world design wrought-iron home knocker with 2" x 6.5" x 1/4" hand hammered supporting plate and 1/2" x 4" solid forged metal ring. Hand forged Wrought Iron Drawer Pulls for case doors and drawers, and drawers, and today in 16" length for the devices. 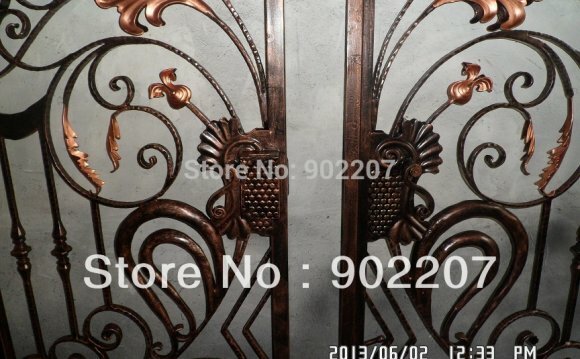 They're genuine, heavy-duty hand forged wrought iron cabinet brings. Great fat and experience, they will certainly considerably replace the appearance of your present cupboards or compliment the old-world appearance of your new building task. Extremely ergonomic for everyday usage. Our Iron Drawer Pulls tend to be truely hand forged from metal bar stock. These feature our hand hammered classic design ends up, shown within our exclusive tumbled metal finish available upon demand only at Paso Robles Ironworks.